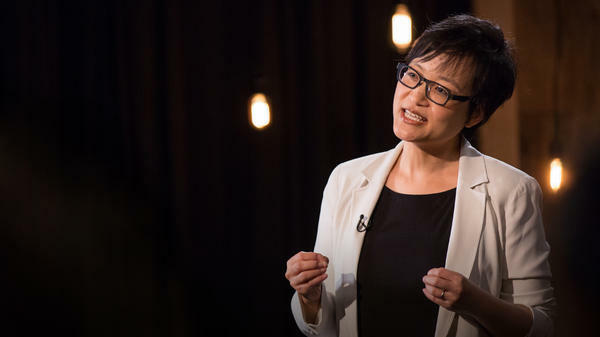 Ruth Chang: How Can Making Hard Choices Empower Us? Part 3 of the TED Radio Hour episode Decisions Decisions Decisions. One choice isn't always better than the other. Philosopher Ruth Chang says, once we realize that, it's easier to embrace the hard work of decision-making. Ruth Chang is a professor of philosophy at Rutgers University. Her research focuses on decision-making and the human condition: how do we exercise our freedom through the choices we make? Do you have a hard time making choices? Or is it, like, pretty easy for you to do that? RUTH CHANG: I cannot make a decision to save my life. RAZ: Oh, wow, really? You're the decision-choice person. CHANG: I'm a terrible decision maker. RAZ: That leaves no hope for the rest of us. RAZ: This is Ruth Chang. She's a professor of philosophy at Rutgers University. And she studies hard choices. CHANG: So what I should say is I used to be a terrible decision maker. CHANG: But that's how I got interested in thinking about hard choices. RAZ: Can you help me make a decision about something? RAZ: I can't tell you exactly what it is. I just need to know what to do. CHANG: So I believe that there are five steps to confronting a difficult decision. CHANG: Do you want to hear the five steps? CHANG: OK. The first thing you have to do when you're confronting a hard choice is to figure out what matters in the choice between the alternatives. RAZ: So, like, write them down? CHANG: Write them down. And they'll be a mishmash. CHANG: Then you lather, rinse and repeat. You go back. And you think, well, gee, did I miss something that matters in the choice? CHANG: Then you recognize that you're in a hard choice. There is no best answer. The next step - commit to one of the options. Create a reason for yourself to pursue that option. RAZ: Ok. So what's five? CHANG: So five is not really a step. It's more of a consequence. When you commit to something, you create your own identity. You make yourself into who you are. Those are the five steps. RAZ: OK. I admit, a five-step plan might sound way too simple, especially when you have to make a big choice. But Ruth Chang says it doesn't actually have to be that hard. Here she is on the TED stage. CHANG: I think we've misunderstood hard choices and the role they play in our lives. We shouldn't think that all hard choices are big. Let's say you're deciding what to have for breakfast. You could have high-fiber bran cereal or a chocolate doughnut. The cereal is better for you. A doughnut tastes way better. But neither is better than the other overall, a hard choice. Realizing that small choices can also be hard may make big hard choices seem less intractable. What makes a choice hard is the way the alternatives relate. In an easy choice, one alternative is better than the other. In a hard choice, one alternative is better in some ways. The other alternative is better in other ways. And neither is better than the other overall. When I graduated from college, I couldn't decide between two careers - philosophy and law. So I got out my yellow pad. I drew a line down the middle. And I tried my best to think of the reasons for and against each alternative. I did what many of us do in hard choices. I took the safest option. And as I discovered, lawyering didn't quite fit. It wasn't who I was. So now I'm a philosopher. And I study hard choices. And I can tell you that fear of the unknown, while a common motivational default in dealing with hard choices, rests on a misconception of them. Hard choices are hard not because of us or our ignorance. They're hard because there is no best option. RAZ: OK. Here's a recent example from my own life. This is a small decision. It was actually really hard. We were at a fish restaurant where they're really famous for their fish and chips. But the haddock was really fresh that night. So I ordered the haddock. But then they brought the fish and chips to my son. And when I watched him eat it, I was really regretting the choice I made. CHANG: OK. Two things that might be happening in that case - one is that you just made a mistake, all right? The cod was better. RAZ: The haddock was pretty good, I have to say. CHANG: But if the cod was better than the haddock, then you made a mistake. RAZ: But how would I know, right? I mean, I guess I could taste them and then decide. CHANG: Yeah. I mean, that's like asking how do we know when one thing is better than the other? That's very difficult. How do we know anything? What I'm interested in is the second possibility, which is suppose the cod was better in some of those respects, the haddock was better in other respects and yet, neither seemed to you at least as good as the other overall. And it's going to sound crazy when we're talking about fish dinners. CHANG: But one possibility is to commit to one of the dinners, right? I commit to cod. I'm a cod guy. And by committing to the cod, you actually can create a reason for you to have the cod, which then may give you most reason to choose the cod over the haddock. Now, that seems less crazy when we're talking about careers - right? - or people to marry or places to live. CHANG: But the structure of each of those choices will be the same. RAZ: When we come back, Ruth Chang on why committing to a decision not only helps you make the right choice but helps define who you are. I'm Guy Raz. And you're listening to the TED Radio Hour from NPR. RAZ: It's the TED Radio Hour from NPR. I'm Guy Raz. And on the show today - Decisions. And we were just hearing from philosopher Ruth Chang on why both big and small decisions can be hard. But one way to make them easier is to commit. CHANG: So suppose you spent your whole life never committing to anything, never putting your agency behind something. You drift through life, which most of us do. Well, what's sad is that you've never exercised this amazing power you have to create reasons for yourself. When you drift through life, you're never the author of your own life. You're just something being buffeted around by your circumstances. I think that what we've missed is that we have this other capacity to commit to things and to actually write the story of our own lives by committing to people and projects and plans of actions that then create reasons for ourselves to live one way as opposed to another. RAZ: Here's more from Ruth saying on the TED stage. CHANG: I think the puzzle arises because of an unreflective assumption we make about value. If what matters to us can't be represented by real numbers, then there's no reason to believe that, in choice, there are only three possibilities - that one alternative is better, worse or equal to the other. We need to introduce a new, fourth relation, beyond being better, worse or equal, that describes what's going on in hard choices. I like to say that the alternatives are on a par. When alternatives are on a par, it may matter very much which you choose, but one alternative isn't better than the other. That's why the choice is hard. Understanding hard choices in this way uncovers something about ourselves we didn't know. You faced alternatives that were on a par, hard choices. And you made reasons for yourself to choose the exact hobbies you do, to live in the exact house you do, to work at the exact job you do. It's here, in the space of hard choices, that we get to exercise our normative power. We can put our very selves behind an option. Here's where I stand. Here's who I am. Far from being sources of agony and dread, hard choices are precious opportunities for us to celebrate what is special about the human condition, that we have the power to create reasons for ourselves to become the distinctive people that we are. RAZ: So I completely hear you. And I heard Sheena, and I heard Malcolm. But it's still hard. Like, making a big decision is still sometimes agonizing. So how do we make peace with it? CHANG: So when people agonize over a hard choices, the source of the agony is usually lack of information. If only I knew how this alternative would work out I would know that this is better than that. And what I want to say is, that's a mistake, that even if you had a video of your two possible futures and you could watch them side by side, it could be the case that your two future careers - let's say being a lumberjack and being an accountant - are on a par. Even some omniscient being couldn't determine, look, this life for you - this future life is better than that one. And now the question is, well, what do you do? And I think what you should do is turn inwards and ask yourself what can I commit to? If you can commit to one of the options, then by putting your agency behind that option, you could actually do this incredible thing, which is you can confer a value on that option. You can make it the case that now you have this reason to pursue that option that you didn't have before. And I think that's a power all rational agents have. RAZ: Ruth Chang - she's a professor of philosophy at Rutgers University. You can find her talk at ted.com. Transcript provided by NPR, Copyright NPR.